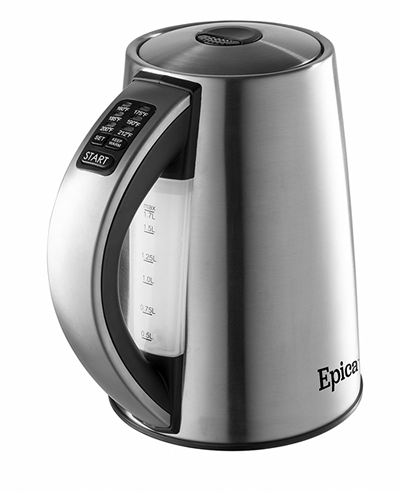 When you try to find the Epica kettle on their company website, you will be disappointed. It is not there. Are they ashamed of it and hide it like the embarrassing cousin nobody likes in the family? There is no reason – the temperature controlled kettle makes a good first impression (unlike the cousin). The stainless steel looks clean, robust and functional. The conical design is traditional, elegant although slightly unexciting. It wants to be recognized as a kettle – nothing wrong with it. You open the kettle by pushing a black button on top of the lid. It is a quick kettle. For the 1.7l it needs just about 5 minutes to boil the water. No beep, lights just go out, and the noise stops. The temperature control sits on top of the handle. There is a select button you press until the desired temperature is reached (default is boiling). The lowest programmable temperature is 160°F/71°C which is, with some green tea exceptions, enough for teas and coffee. It also has a ‘Keep Warm’ button for each temperature setting. Epica offers a generous 2-year warranty. Be aware that you might have to return the kettle to the manufacturer, not the seller. 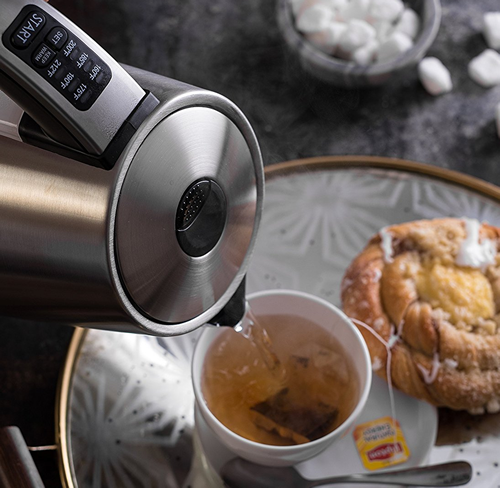 Worth mentioning that the adjustable kettle is BPA free and therefore safe to use. 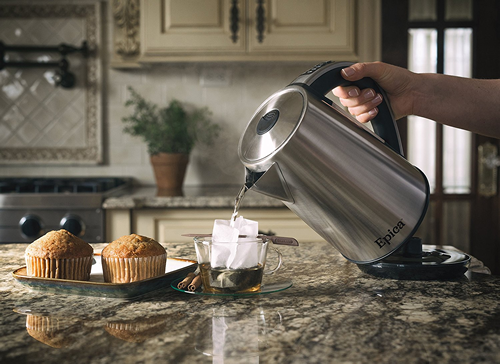 The Epica kettle is a good, reliable product with all the expected features of a medium priced temperature adjustable kettle. For the ‘normal’ price of $94.95, it would be well overpriced. It is hard to imagine that the price will go back to the original amount. Still, take advantage of the fair price while it lasts.